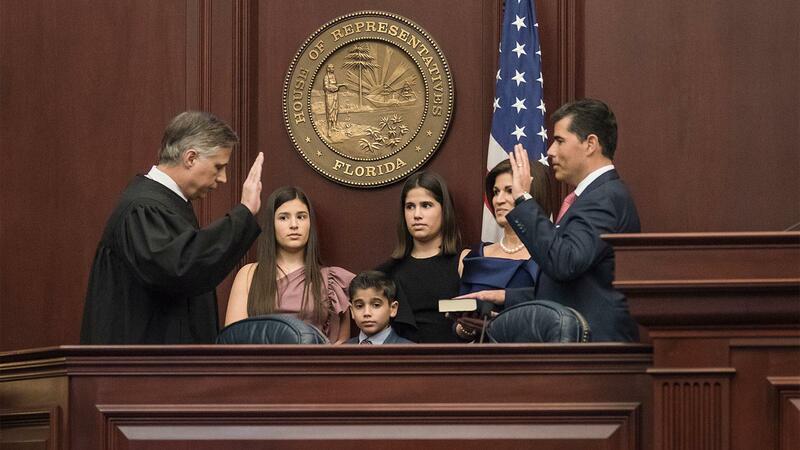 Rep. José Oliva takes the oath of office for Speaker of the Florida House, alongside his wife, Jeanne, and children Celeste, Sabrina and Benjamin. José Oliva is now the presiding member of the Florida House of Representatives. The cigarmaker and CEO of Oliva Cigar Co., who has served as a Florida State Representative since 2011, was elected Speaker of the House last week. During a brief address, Rep. Oliva laid out his vision for easing government regulations, seeking "to remove the countless and unnecessary barriers to prosperity, to opportunity and to freedom." Rep. Oliva, a Republican representing Florida’s 110th district, was elected to the position after his party retained control of the House in the midterm elections. He was sworn in last Tuesday and will serve as the 101st Speaker of the Florida House of Representatives until 2020. Before entering Florida politics, Oliva worked full-time in the family cigar business. The Oliva Cigar Co. was founded in 1995 by his father, Gilberto Sr., and brother Gilberto Jr, but the family has a tobacco-growing history that dates back to Cuba in the late-1800s. In 2010, José Oliva was an up-and-coming cigar industry executive, heading sales for Oliva Cigar Co. and serving as the de facto face of the company. But it would not be long until he embarked on a second career, this time in Florida state politics. Oliva won a special primary election in 2011, which earned him the chance to fill a vacant seat in the Florida House. He then went on to win the general election and has served as a State Representative for the last seven years. During his time in office, Rep. Oliva has maintained an active position with Oliva Cigar Co., which in the past five years has seen growth, accolades and a high-profile acquisition. In 2012, the company announced the creation of its Serie V Melanio brand and, two years later, the figurado size was named Cigar Aficionado’s Cigar of the Year. In 2016, Oliva was purchased by J. Cortès Cigars N.V., a Belgian company that specializes in machine-made cigars. According to the Tampa Bay Times, dozens of family members attended the swearing-in ceremony for Rep. Oliva. Florida’s next legislative session begins March 5, 2019.